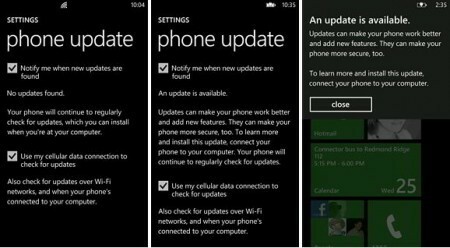 There has been long wait for Windows Phone 7 update which should bring highly demanded Copy-Past feature to WP7 phones, unfortunately yesterday’s Windows Phone 7 mini-ROM update is only aimed to fix & improve software performance. This update is similar to what Microsoft had provided to Windows 7, “improve the software update process itself”, paving the way for all future goodie-filled updates. Well it looks Wp7 update thing didn’t went as expected & several users end up bricking their phones and complaining about incomplete update or having stability issues when updating. “Backup gets stuck at 100% (Step 7 of 10) and the update doesn’t carry on” those users which this type of errors are still lucky as phone is still usable but the one who got their phone bricked will have no other option then get it to replaced from service center. One of Neowin user has complied some troubleshooting steps to fix your device which comes with absolutely no guarantee. You may follow these steps to fix your Windows Phone 7 as there is not harm in doing so since the phone is already in bricked state. 1. Unplug USB form computer. Charge phone or put in charger. 3. Turn on phone using 3 buttons – power, camera and volume up/down rocker. Keep all 3 held for 10-15 seconds. Do not release when it asks if you want to format the SD card. 4. Keep holding until it says “download mode”. This will reinstall the OS. 5. If phone does not reboot in 15 mins just power it off and back on. 6. Re-setup phone, update firmware through Zune software and then re-sync your documents, music, pictures, videos, etc. If you get any workaround to fix your bricked Wp7 phone do share with us via comments. We would love to add it in above steps.